Technical Support Company: ALLIX Co., Ltd. The biggest advantage of LED lighting is economic efficiency. Consumption of electric power is one-seventh of that of incandescent lamps, and life span is more than 20 times longer. For this reason, LEDs are pushing away a 130-year history of incandescent bulbs and are becoming popular as new light sources. However, if the heat generated from the LED chip is not effectively discharged, the performance is significantly deteriorated. That's why the LED industry's efforts to boost heat dissipation continue. 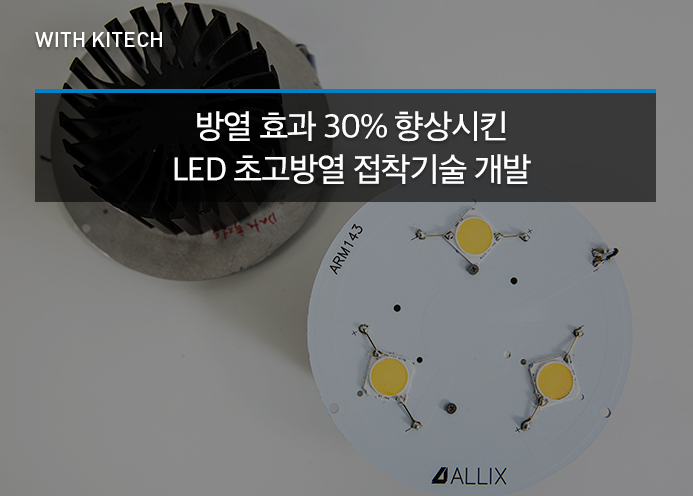 ALLIX Co., Ltd. is a LED specialized LED company that produces LED module and lighting products based on LED package technology. Its main products are 30~300W high power, high CRI LED for industrial use. High CRI LED is a light source that is close to natural light and is used in special industries such as medical, broadcasting, museum and plant cultivation. Industrial LED lighting uses a high power LED chip of 30W or more, which leads to increased heat emission. If the heat generated from the LED chip is not properly discharged, the brightness of the light is lowered and the lifetime is reduced. In addition, heat can damage surrounding components. "Solving heat problems in the LED field is paramount. Typically, LED chips have a lifetime of 50,000 hours but failure to properly control heat dissipation will reduce the lifetime by 50%. That is why heat dissipation technology is the core technology of LED products. Jong Uk "Lonnie" An, CEO of ALLIX Co., Ltd., focused on 'how to obtain more efficient heat dissipation technology'. Kwang Seok Kim, senior researcher of carbon light-weight materials application group at Jeonbuk regional headquarters. Kim was working on the research because he thought that he could utilize the carbon nanomaterial technology to increase the heat dissipation efficiency of the LED package at the time. The two people began to develop technology in 2016. ​﻿​ The core of high power LED heat dissipation technology is to use the paste (adhesive material) made by new technology to attach the LED chip to PCB, so that the heat generated from the chip is released well. Conventionally, an adhesive material in which an inorganic powder is mixed with a polymer material such as epoxy or silicone has been used. However, there is a problem that the heat radiation performance is limited due to low thermal conductivity. Silver has also been developed for adhesive materials with high heat dissipation, but it was expensive and difficult to use for general LED products. 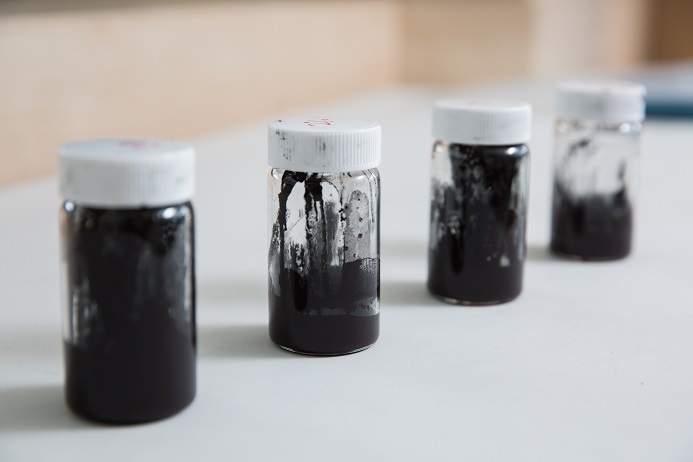 To solve this problem, Kim developed a copper-based carbon nanotube paste. With this technology, heat dissipation of 30% higher than conventional silicon based paste can be obtained. While the effect is similar to that of the material paste, the raw material price is about 1/10 lower. In addition, it is advantageous to commercialize the paste itself as a source material technology because the heat dissipation performance is improved immediately if the module is replaced without changing the design and structure of the heat sink or LED luminaire. Kim said, "The LED module temperature, which was 137 ℃ when using conventional paste, showed a drop to 100 ℃. There will be some variation depending on the experimental conditions but if it succeeds in mass production, the ripple effect will be very great." The use of copper instead of silver for paste can significantly reduce production costs. ﻿Kim, who is currently preparing related patents, predicts that ultra-high heat-dissipating paste will be demanded not only in the LED industry but also in electronic devices such as notebooks, electric cars, and mobile phones where high-performance CPUs are used. CEO Jong Uk "Lonnie" An also has great expectations for the technology developed this time. 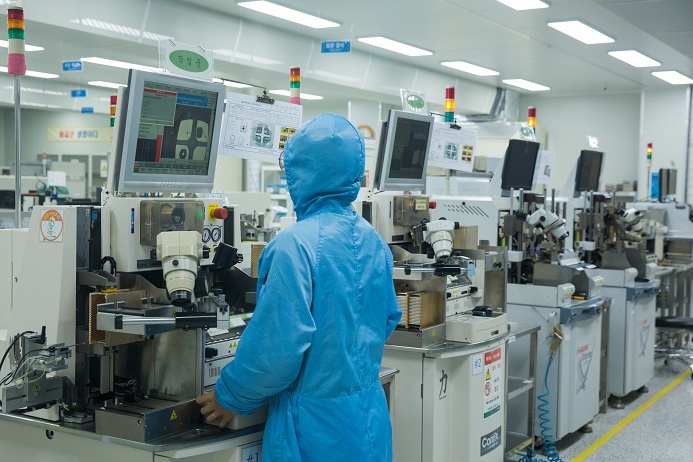 In 2022, which is expected to enter the mass-production stage, products with ultra-high heat-dissipating paste technology are expected to generate sales of around KRW 300-900 billion. It is 1~3% of the world's high CRI LED market. ﻿"We plan to apply it to all existing LED products and equipment necessary for mass production will be ready. We believe that it will not only increase direct sales, but also increase the reliability of products and enter into global brands. We also plan to develop and sell paste itself. " The heat dissipation design and material development that efficiently discharges the heat generated by the LED is a core technology of high power LED, but it was difficult to commercialize it due to the expensive raw material price. The ultra-high heat bonding technology using copper-based carbon nanotube material is expected to act as a catalyst for the globalization of domestic high power LED products by completely solving these problems.